» Nutrition » So where do you get your protein? Most of us veggie lovers know how to answer this common question without skipping a beat. However if you’re not quite sure, and you’re worried about getting enough protein on a vegetarian diet… then read on. The truth is, most North Americans get way too much protein. As a vegetarian or even a vegan you can easily get more than enough protein in your diet as well. Many people still believe that protein is only available from meat and animal sources. A lot of meat lovers think that we will all fall over dead without “indulging” on a daily dose of steak, cheeseburgers or chicken fingers ! Vegetarian or meat eater ……I believe that 80% of our food intake should be the same. 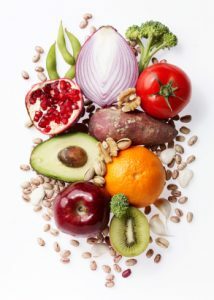 A healthy diet should be based around fresh vegetables, fruit, whole grains, legumes nuts and seed. The difference is your protein intake. So, were do vegetarians get their dose of protein from? Foods are not created equal, but there is protein in everything from a black bean to a blueberry. In fact, calorie for calorie, vegetables often beat out animal products with their protein punch. For example, ground beef is approximately 38% protein, while spinach comes in at a whopping 50%! On the lower end, fruits such as bananas, pineapples, mangos, and even grapes, all contain 4-5% protein. Just remember……..nature gives us ‘perfect food’, so as long as you eat a variety of whole plant foods, you will be getting more than enough protein in your diet. It’s that simple. Warning! I know a plenty of unhealthy vegetarians! It’s very possible to be a ‘junk food’ vegetarian, and to go about your day eating processed, chemically enhanced, ‘food-like substances’. (more on this topic later). When done correctly, a vegetarian diet has tons of health benefits. If you have made the choice to cut animal products out of your diet, first and foremost, kudos to you! The next step is to fully educate yourself. That way you make sure you are feeding your body what it needs to stay healthy and full of energy. It’s not that complicated; just keep it simple. Eat whole, fresh, living foods. Variety is the key.